Frack-o-mania has resurged on the Hudson as pipeline opponents have resorted to usual lunacy and attracted wacky allies to come upriver and join in the fun. The fractivist cause generates laugh out loud moments with regularity. That’s why we have a tab above for “Frack-O-Mania,” which largely consists of some the wacky imagery of fractivists combined with a quick observation and a poll question. Occasionally, though the subject warrants a little more discussion. We have a fine example from Peekskill, New York, located up the Hudson River from Manhattan in Westchester County, where the Indian Point nuclear facility is located and Spectra is involved in some pipeline construction. Things are happening quickly as physical destruction in our home towns has begun in Spectra’s construction of the AIM pipeline. Resistance has quickly become intense, and that intensity will just keep heating up. Yesterday, Nancy Vann, president of Reynolds Hills (here) and founder of Safe Energy Rights Group (SEnRG) (here) couldn’t take it any more. Surprising everyone, including herself, she sat down on Reynolds Hills property and wouldn’t get back up. Spectra wrenched land from Reynolds Hills through eminent domain and were cutting down trees. The tree cutting stopped. County police threatened arrest but when their bluff was called they backed down and left. There was coverage on WHUD, News 12 and Fios. And this morning, the Montrose 9 who were arrested blocking access to a Spectra staging area had their day in court. They held their banner with peaceful presence when they were arrested, and they stood in calm and self-possessed dignity before the court. 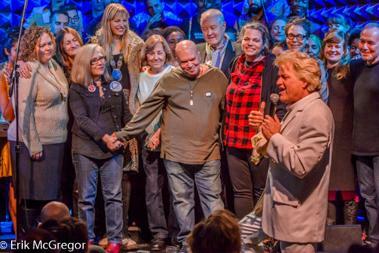 In between, they were honored at the Reverend Billy and the Stop Shopping Choir’s show at the Public Theater’s Joe’s Pub. After court, there was a much larger action at the site of yesterday’s Nancy Vann sit in. This time, Channel 2 came up from the city and Channel 4 sent their helicopter. For absolutely up to the minute news visit the “Resist AIM Pipeline” Facebook page (here). The protests so far have mostly involved people from Brooklyn and Southern Westchester. It’s time for locals to start getting involved. So: Peekskill, Verplanck, Buchanan, Cortlandt, Yorktown: it’s time. To get involved in direct actions – in roles that risk arrest and a wide variety that don’t – sign the pledge (here) and attend an Intake Meeting – there’s one tomorrow afternoon (Saturday November 21st) right here in Peekskill. Morale Officers – Husband & Wife Team? Yes, it’s all one big lark for these folks – the valiant attempt of a bunch of attention-starved spoiled children to secure validation of superior intellects known only to themselves. The chief organizer of the party (or, perhaps, the “Maximum Leader”), Nancy Vann, is a former financial services attorney turned “environmental activist,” so it seems highly unlikely she surprised herself by sitting down and getting arrested. Rather, that would appear to have been the objective all along given the presence of media no doubt tipped off in advance. The media folks, of course, didn’t need more than a whisper in the ear to join in the fun themselves, even sending in the helicopters to capture it all for posterity, demonstrating the unholy alliance that makes a mockery of honest reporting. It reminds of a television debate I did a few years ago for the Westchester station and the fellow attending to our green room needs made some snarky remarks about not much liking anything west of the Hudson and, when asked why, replied “because they’re all Republicans.” He virtually spit it out and it was a reminder of the holier than thou attitude that pervades both metro media and much of what passes for environmentalism in that neighborhood. Westchester County, of course, has plenty of Republicans but this fellow apparently didn’t know any of them. Likewise, the folks running the Peekskill Pipeline Project don’t seem to have as much local support as they’d lead us to believe. Their acknowledgement “the protests so far have mostly involved people from Brooklyn and Southern Westchester” gives it all away. They are relying upon chameleons, noisemakers and organizers from mostly outside the area to carry the ball and it’s all about getting attention for themselves. Despite suggestions to the contrary they’re not stopping pipeline construction and won’t. It’s all one big game. 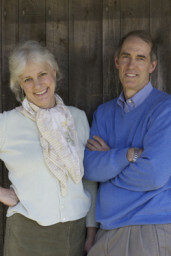 Grassroots Environmental Education is run by the husband and wife team of Doug and Patti Wood. I debated the latter a few years ago and you can read about it here, but her remarks, as I reported then, basically consisted of “non-stop uncompromising negativism.” Her husband was treated me as if I was a member of the “Walking Dead” and I had the distinct impression he wished me so. That is the essence of frack-o-mania: non-stop uncompromising negativism combined with an insatiable desire for attention – the virtual definition of a spoiled child and the wailing and whining has resurged on the Hudson. You have to laugh that this is what passes for political debate in New York, or at least, that part of it east of the Hudson. Wow. So occupy photographer erik mcgregor has taken a photo of judith canepa, someone who attempted to get people in the rockaways to believe that the rockaway pipeline was for export and was then part of the port ambrose is a secret export conspiracy widely reported in the press, engaging in this pipeline resistance? Patti wood went on the radio broadcasting the port ambrose export conspiracy theory and no reporters in new york city and state recognize that the same people keep showing up everywhere whether hearings, protests or as miseducators at some local forum? When is the press going to get up to speed on the great fracking pipeline resistance, who it consists of in reality not hype and what they are peddling? I can say point blank the press appears to be behind the times, unable to connect dots and more than once, twice and three times have refused to even correct wildly inaccurate reports and fail to recognize fact based important news and tips when delivered right to them. Yes, when will the press start doing real journalism instead of supportive advocacy?